Hello everyone! You may remember my posting earlier this week about a stamping friend, Sarah Anderson and her son Henry, who passed away on monday. Henry was 3 years old. He developed a fever on friday and his litle body couldnt fit off whatever took over him. The family still doesnt know the cause. Please continue to pray for Sarah and her Husband, and Henry's little brother Jack and all the friends and family of the Anderson's as they go thru this incredibly difficult time. Henry loved the zoo, he loved being outdoors, he loved the snow, comic books, starwars. He was a fun loving 3 year old little guy. It is my honor to release, Henry. 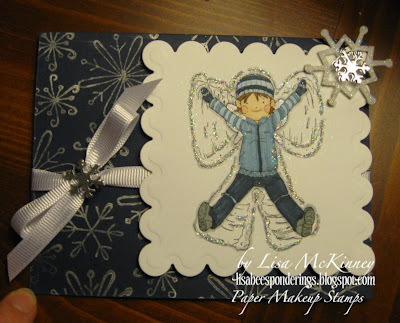 A fairy playing in the snow and making a snow angel for his mama. This stamp is available now in it's digital form. You can purchase it HERE. $2.50 from each sale of this stamp (whether in it's digi form, which is the cost of stamp minus the paypal fees) or in it's rubber form, will go directly to the Anderson family. This will help to build the memorial at the zoo or for any other means the family needs it to keep little Henry's memory alive and well for his little brother Jack. The rubber stamp will be available on November 7th with our November release at 8 pm CST. 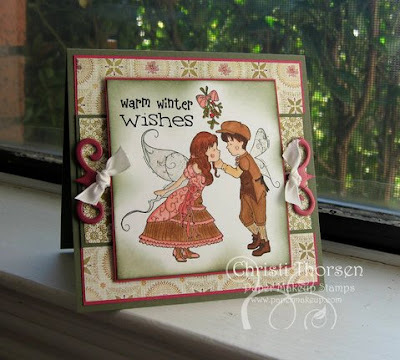 I know so far this has been a rather sad post, but we do have 2 other fairies to snow you today for sneak peeks of what is to be released on November 7h at 8pm CST. Here are 2 little lovebird under the mistletoe. Be sure to note however, leave off the mistletoe and it could work for many other lovey occasions! 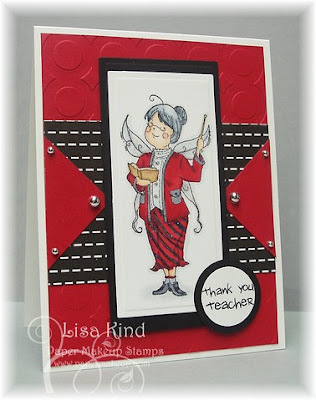 And then we have Ms. Nancy, the warm hearted teaching fairy who loves her fairy pupils very very much! Doesnt she just look like everyone favorite teacher who always smelled of fresh vanilla and always had an encouraging word? Dont forget to leave a comment on each post everyday this week. Everyday you comment, you're entered to win the entire release. Also dont forget about the release part on the 7th! It will be right in our FORUM! We'd love to see you there! And who knows, you may win some stamps just for coming! Katie - what a wonderful stamp you have created in Henry's memory! I already purchased the one from Pink Cat Studio and I will definately purchase your fairy! 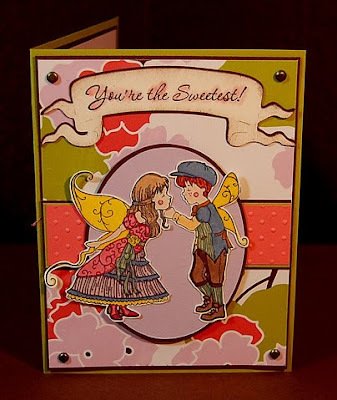 Your fairies are amazing and I look forward to ordering the two little lovebirds! Beautiful samples by the design team as always! I LOVE snow angel Henry~ What a beautiful tribute to him. Adorable stamp to honor Henry. 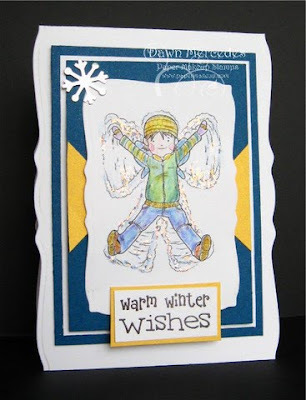 love henry in the snow and the teacher fairy is adorable great job with the samples. what a fabulous stamp in memory of Henry, a tragic loss. That snow angel is absolutely adorable, and a perfect tribute to Henry. I am also loving the kissing couple. What an adorable stamp for so many reasons! Love them all. entirely touching! I think you must be the teaching fairy...for teaching many how to cope with death and leaving a lasting memorial to young Henry. I'm so sorry to hear about little Henry. It's never easy to lose a precious little one, but it's comforting to know that he is with his HEAVENLY Father at peace. Thank you for the beautiful cards to day! Although somber at the beginning...the fairies at the end are certainly cheery enough! I was blessed to spend the day with all 3 of my own fairies. And boy, do I love having them home! All of the fairies are wonderful...but the Henry fairy is my favorite. Great job on the fairies and the memorial. I love the Henry stamp! What a beautiful gesture, he'll be coming to live in my collection! What a great thing to do in Henry's honor! An angel for an angel! What beautiful stamps. Very creative. The Henry stamp is a beautiful tribute to the pure joy such a precious life brought to his parents. 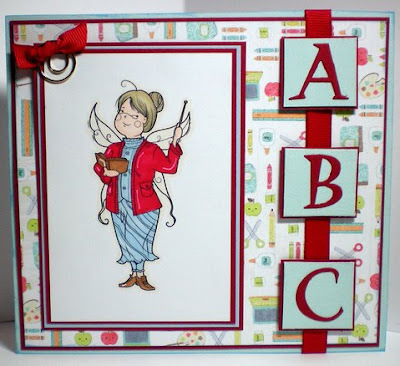 The fairy stamps are adorable and that teacher stamp is "right on". How many of us know a teacher just like that one? When is a male teacher stamp going to appear on the scene to honor all of the men teachers? Or, have I missed it since I am very new to this site? Beautiful, inspiring stamps. Well done. I hope to add some to my collection. Loving all of the new releases as well!! Wow, great stamps and thank you for your help for the Andersons. That's very sweet of you. Nice people like you doing nice things like this make the world go 'round!